Yes, I am aware I am off season with the avatar, art is art for me, make me feel warm and fuzzy. Do you know where my pot of gold is, please? I had a pot of gold and it is missing! Oh, yes, Happy Valentine's Day! My avatar's love you. Toot, Toot. Sorry it took me so long to answer, Seahorse. But Photobucket changed my account over to a new beta format and it is very difficult to navigate and work with. I hope it is the one you are asking for. If it's not, just let me know and give me some more specifics about the one you are thinking of. Yikes Brandi I don't like the new format on photo bucket. It freezes my computer every time I try and go there. It doesn't look like I will be using it much that's for sure. It's an awful format and most of the things I did there are very difficult to do now. And some things are impossible. Up until today, I was allowed to switch back to the old format, and I did. But today, it won't allow me to switch. I sent emails to photobucket answering their questions about why I kept switching back. Of course, that did not help. I also just paid for another full year for my account just last week. I wasn't sure if I should continue the account since we have so few users now who want to change avatars with the seasons. And I have asked people to save the images I create for them to their own accounts or their computers. I guess I have to suffer through a year of this format. But I highly doubt I will pay for my account again next February. We are in the same boat with this format, Green Eyes. I did the same thing. And they just switched it over and told me they no longer supported the old format. It is awful. I never paid as I didn't use it only to post on here. I am sure they are going to lose a lot of people because of it. sorry you are having such a problem. something for Mr. Jenkins for St. Patrick's day? I'll work on Mr. Jenkins today for you! A German Shepherd, eh? Big dog. If you'd like a new seasonal design, just let me know! Last year's avatar designs are here. If you want to use yours from 2011, they can be found here. And the year before are here. Yeah, I know a big dog, but I am working with a german shepard rescue group to make sure it's a good fit! Kinda excited. maybe I need to learn to spell shepherd before I get one! 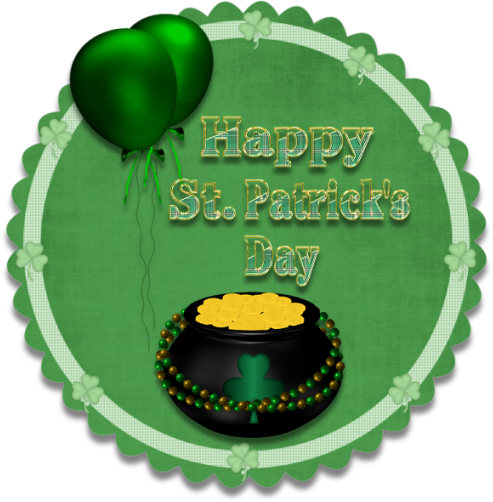 I'll work on some new St. Patrick's Day sig lines for you today and post them this evening. Best wishes on finding a new dog to bond with! I have a woman in Virginia who fosters shepherds looking for one. I hope it is soon. I did have a pot of gold but the little monkey was tossing coins all over the place. You're quite welcome for a replenished pot, Seahorse. I fixed one of Patton's eyes and then I lightened up his body and lightened up his face a little bit more so he would show up well.